Eighteen people other than the commissioners attended the meeting, which covered a range of topics, including the Animal Shelter, Mars Hill Road, the proposed widening of U.S. 441, and the possibility of a property tax rollback. Daniell told the group that the commissioners have not reached agreement on what to do to address county space needs long term but that a proposal to build an addition where the old jails sits was offered by a group studying Courthouse security and is now under consideration. Courthouse security is under the control of the Sheriff, and discussions of the topic are shrouded in secrecy. Daniell did not provide any details about the composition of the group that recommended demolition of the old jail or about the proposed use of the additional space. He merely said that in studying Courthouse security needs the group had proposed that the jail be demolished and the Courthouse expanded. 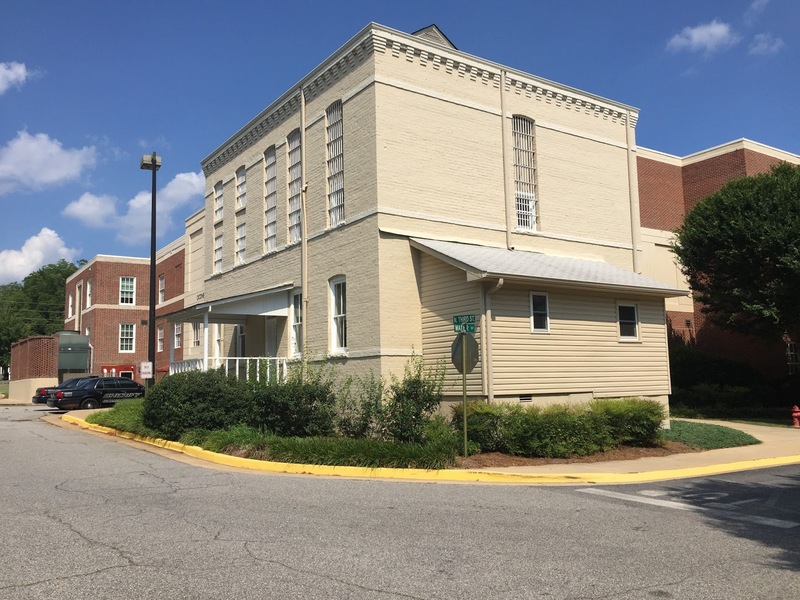 Daniell said the proposed addition was a stopgap measure, that ultimately the Courthouse itself will house only judicial operations, and that the Board of Commissioners has not agreed on where to locate the administrative offices. The old jail, which Daniell said was built in 1905, most recently was used as a probation office and now sits vacant. The building is connected to the Courthouse via an elevated walkway, but Daniell said using the jail again would require a big investment. “We can significantly increase the efficiency of the Courthouse” by tearing down the jail and building an addition it its place, Daniell said. The county believes it can do this work for the amount of money available, Daniell said. Daniell said he has tried to learn of any historical value of the jail and has come up short. A lynching took place outside the jail, he said, and that isn’t a part of the county’s history that should be celebrated. Daniell said there is “no architectural or craftsmanship” element to the jail. One thing that is being considered is incorporating the existing jail doors into a new design, Daniell said. Daniell solicited feedback from those present, and four of those who spoke were in favor of the plan. That included Sarah Bell, president of the Oconee County Historical Society, who said the Society supports the demolition of the jail. Chuck Williams, who represents parts of Oconee County in the Georgia House of Representatives, said he thought people might have a different reaction to the demolition if the jail were not partially surrounded by the existing Courthouse. One person who spoke in response to Daniell’s question was simply trying to understand the exact location of the building proposed for demolition. Daniell was joined by Commissioner Chuck Horton and Commissioner Mark Thomas at the Thursday night meeting. Missing were Commissioner Mark Saxon and Commissioner William “Bubber” Wilkes. The commissioners fielded 20 different questions or sets of questions and spent significant time responding to John Webb, 1320 Bent Creek Road, off Hodges Mill Road, who asked the Board to consider a property tax rollback. Webb had made the same request on Tuesday, when the Board held a public hearing on its proposal to set the millage rate for the coming year at its current 6.686 mills. Because of an increase in property tax valuation, that will result in a tax increase of 4.19 percent in the unincorporated parts of the county. All three commissioners were emphatic in saying that the county needs the additional revenue the property tax will produce and a rollback of taxes is not possible. “I think we’re probably at least two or three years away from being able to do that,” Daniell said, citing the need for money for transportation, employee compensation, and other projects. “I think we’re doing really well not to increase the millage rate,” Thomas said. The first question was from Tom Zahrn, 1171 Cobblestone Lane, in the west of the county off Pete Dickens Road, who wanted to know the status of discussions on the Animal Shelter. Zahrn said he volunteers at the Animal Shelter. Daniell said the Board is waiting on an update to the report from the consultant, who recommended that the county build a new facility to replace the facility at the far south of the county. Daniell said the county does not have sufficient funds to build a new facility but might be able to renovate the existing facility with money being collected at present from the Special Purpose Local Option Sales Tax. Rep. Williams asked for an update on the Mars Hill Road widening. Daniell said work on Phase I of the project running from SR 316 to Butler’s Crossing is on schedule and should be finished by May of next year. Right of way purchasing for Phase II from Butler’s Crossing to the U.S. 441 bypass of Watkinsville is complete, he said. The county is tearing down signs and doing similar work to certify the right of way before funds can be released for actual construction, he said. The hope is that when Phase I construction is completed work will begin immediately on Phase II, Daniell said. Larry Preston, 1150 Northwoods Road off Mars Hill Road, asked about the status of the proposed widening of U.S. 441. The Georgia Department of Transportation said in March that a U.S. 441 bypass of Bishop was no longer being considered. Instead, the plan was to build roundabouts at either side of Bishop to slow traffic moving through the center of the small town. Daniell said it is his understanding that GDOT is now considering alternates to the announced plan, including the possibility of a bypass. “We’re just waiting to see what they’re going to say,” Horton said. “I’m intrigued by the roundabouts,” Daniell added. The video below is of the entire Town Hall Meeting, which ran just more than 80 minutes. Daniells’ announcement on the proposed demolition of the jail begins at 1:06:10 in the video. Webb’s questions about the tax rate starts at 13:14. Zahrn posed his question at 0:35. Williams asked his question about Mars Hill Road at 10:08. Preston had asked about U.S. 441 just before that, at 6:08. OCO: BOC Town Hall 7 13 2017 from Lee Becker on Vimeo. Demolition of the Old Jail would be an assault on history. There are alternative uses of the old block building which preserve valuable history. Roundabouts in Bishop will be pinch points during times of heavy traffic and long, large, heavy trucking. The millage rate thing is kind of a joke. Commissioners can brag about keeping the millage rate the same, even lower them, while the assessed value of property can rise and fall as needed. I am not charging dishonesty; I am saying that relying upon home values rising or falling is suggestive of the possibility, and perhaps evidence, of fidgeting with said values. What history are you talking about? Erasing history does not make it go away. The jail building is a significant, and perhaps last, remnant of Jim Crow-era lynchings in Oconee County. I have long been struck by the fact that there are over a half-dozen commemorative markers visible from the front of the Courthouse, but none remembering the men who were killed by vigilantes in the county. If the Old Jail is going to be taken down, a plaque or other remembrance should at least be posted to remember the events of the past. It may not be "good" history, but it is our history.